Contrasty day. ‘Dragon’s breath’ low mist/cloud in the morning with showers (rain down low, snow up high), clearing to glimpses of blue sky after 1pm. Hills look quite white with the sun out but it flatters to deceive. 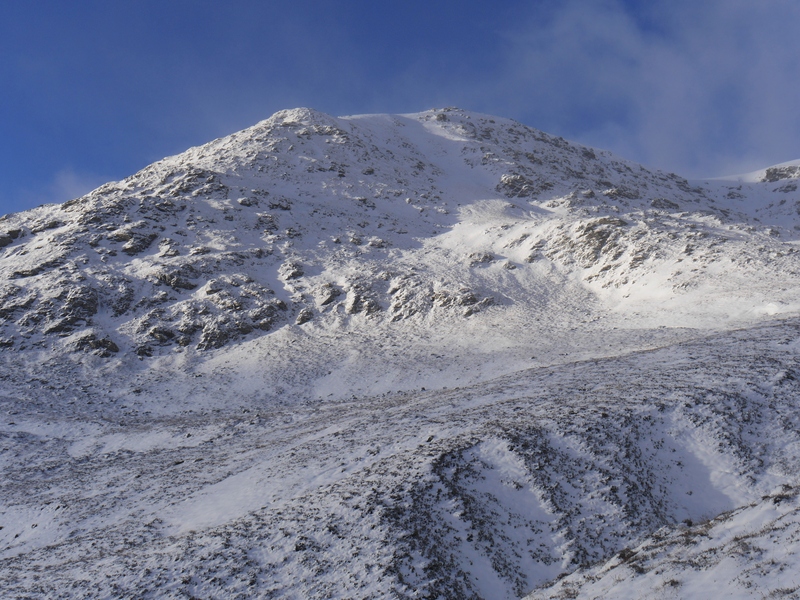 Certainly some wind blown new snow building up high on some scarp slopes today, especially those in the lee of a long plateaux fetch, but overall cover remains quite modest in all places. (Above) Looking out of the glen between An Cearcallach (993m) and Meall Coire Choile Rais (1080m). Loch Laggan visible below mist and low scudding shower clouds this morning. 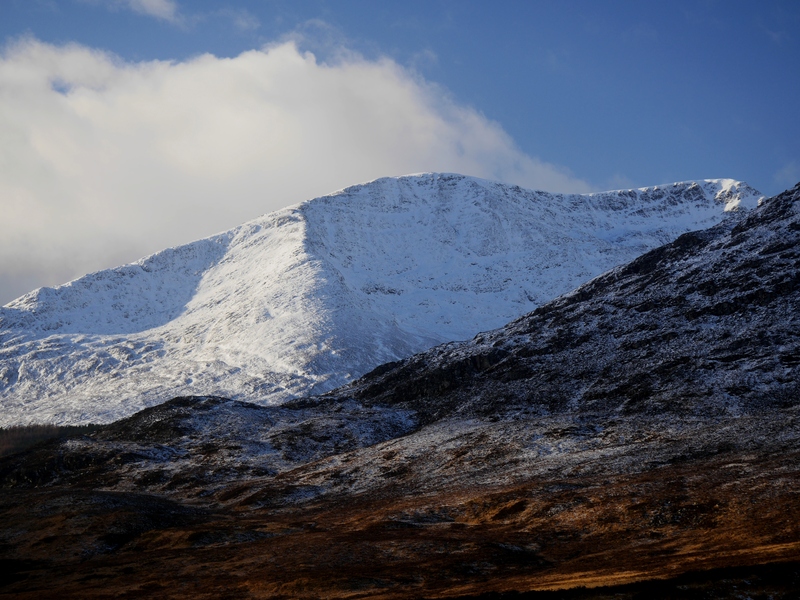 (Above) An Cearcallach itself bathed in momentary sunshine. The wide bay high on this East-facing aspect is usually meters deep with snow at this time of year but has barely any right now. This was the site of a huge wet slab avalanche (crownwall 3 to 4m high, I think) a few years ago, with debris running out down to the bottom of the glen. (Above) Beinn a Chaorainn today. Sketchy snow cover even though it looks quite white in the sun. 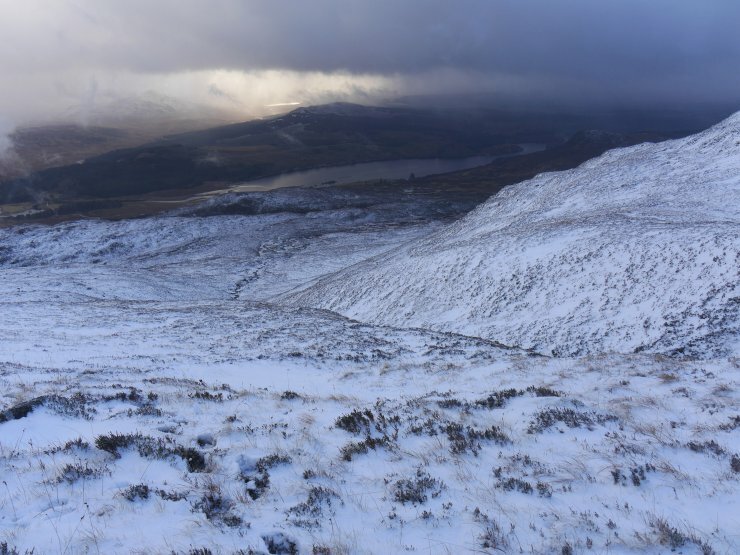 Weather forecast is for it to remain dry and cold overnight Sunday/Monday with winds picking up to very strong during the morning and snow showers later. Stability expected to remain good in all places until the strong winds start moving snow around so will decline quite late in the day, more so when the snow showers begin in the afternoon.